Cambodia has plentiful sunlight all year round, and an unstable electricity grid. Taken together, solar powered lights seemed like an ideal solution, and our task was to design and build a set of solarpowered lights for the Happyland Orphanage. This project required our students to integrate electrical engineering and product design concepts together with appropriate technology and usability. Instead of off-the-shelf solutions, our students chose to design their own light to best fit the requirements of the orphanage, and the challenges of the environment (such as the rough handling expected from children, and the torrential rainstorms). Our final solution was a small, portable, integrated light with solar panels that could be carried out into the open to recharge during the day, and taken indoors at night to study by. The cases are waterproofed against downpours, and padded appropriately to withstand both a drop test and a bash test. To address the challenges of usability and robustness, a tilt switch was incorporated to turn on the light automatically when the whole case is tilted to the optimum angle for desk lighting. Figure 1. 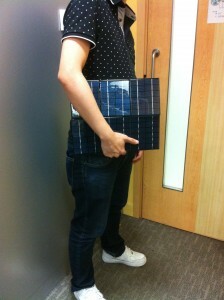 We carried out the experiments on the portability of solar lights. Figure 2. 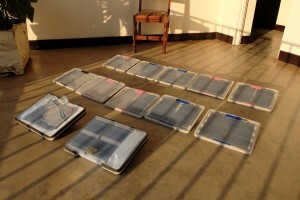 We recharged twelve sets of solar light under the sun in Kigali. Figure 3. 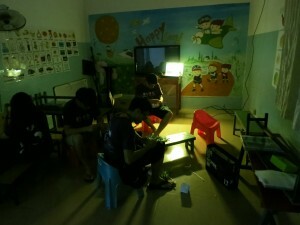 We worked under the solar lights in Cambodia Happyland Orphanage where the electricity supply was instable and insufficient. Figure 4. We taught the Rwandans how to use the set of solar light in their daily life. Figure 5. We gave the NGO (African Evangelist Enterprise) our several solar light sets.